Leave a review on any ONE of these four books on Amazon, and get one FREE! Escape Essay Hell! is a short and simple guide to help students write their dreaded college application essays. Featuring Essay Hell’s best advice and tips, Escape Essay Hell takes students step-by-step through brainstorming unique topics and the narrative writing process. It’s really a crash course in writing a personal statement! College admissions experts advise students to “Be Yourself” and write essays that are help them “Stand Out” from other applicants. But no one shows them exactly how to do that. In this simple to follow guide, Escape Essay Hell teaches them how to write essays that are engaging, meaningful and memorable—which naturally help them stand out from the competition and land in their dream schools. Most prompts for major public universities around the country. Most prompts for transfer and scholarship essays. Escape Essay Hell! is available in paperback and Kindle ebook at Amazon here. Don’t have a Kindle? To purchase and download a pdf version of Escape Essay Hell! for instant access, click the Buy Now button below. Cost: $9.98. The best way to learn how to write a narrative-style college app essay is to read what others have written. This is a collection of 50 sample college app essay written mainly by my former students. Most followed the steps outlines in my writing guide, Escape Essay Hell!. And they all got into amazing schools—including the most competitive, such as Harvard, UCLA, Northwestern, Cornell, Penn, Berkeley, Brown, Williams, etc. By readying Heavenly Essays, students can get a sense of what a narrative essay is all about, and also find ideas for their own topics. It’s available at Amazon here. Don’t have Kindle? To purchase and download a pdf version of Heavenly Essays, click the Buy Now button below. $9.98. Don’t have Kindle? To purchase and download a pdf version of Essay Hell’s 2015-16 Prompts Primer, click the button below. $4.98. This is my most recent writing guide. It has everything a student needs to learn how to craft a winning narrative-style essay for a college application, plus some. It’s really a writers’ toolkit, packed with easy-to-find tips and advice on how to use literary techniques, strategies and devices to power your writing. This is an ideal guide for any student who really wants to not only nail their essay, but also practice and learn invaluable writing skills that will help in college and the workplace. Instead of taking student step-by-step through the brainstorming and writing process (like Escape Essay Hell! ), this is a guide for ambitious students who want to spend the time to really enhance, develop and craft their essays into effective, meaningful and outstanding writing pieces. It’s available in paperback and Kindle ebook on Amazon here. Janine Robinson gives the college counselor the best single tool and resource to help the college bound student get a grip on the College Essay, in its various forms. Her comments and insights on the Common Application essay are easily conveyed to the teenager who needs to get a start and following Ms. Robinson’s blog, https://www.essayhell.com/author/j9robinson, provides her readers with a continuing commentary on the emerging new prompts. Ms. Robinson has just published a smaller guide bringing together her approaches to the five new Common Application essay prompts, so get your hands on both books and you have all you need. And frankly, the books and the blog are just about the most accessible resource I have seen in a summer of searching. 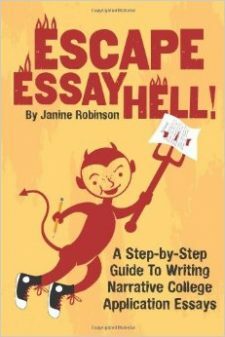 If you are applying to college and need help writing the dreaded college essay, Janine Robinson’s book `Escape Essay Hell!’ is must-read! It’s ‘teenager friendly’ and offers a variety of anecdotes and examples that are tremendously helpful. This guide takes you step-by-step through the process. Ms. Robinson ‘hot tips’ allow any student to master the art of writing an effective personal statement with less stress! An excellent resource from a real pro! College applicants facing the purgatory of application essays now have a guidebook to lead them out. In this straightforward ebook, journalist, tutor and college essay expert Janine Robinson takes a practical approach to breaking down the steps involved: from brainstorming topics to choosing the best one and from writing and rewriting to editing. Presented in an engaging and creative way–with “Hot Tips” from Essay Hell’s mascot, Dante–this guidebook is a stairway to completed-essay heaven for stressed-out college applicants and their parents. Writing college application essays may indeed be a necessary evil for most college-bound students, but you can have fun writing them–or at least explore creative aspects of your own personality as you search out topics. Reading about how to write essays, too, is interesting and fun in Essay Hell. The author, Janine Robinson, has a light touch and a wry sense of humor, and includes snippets of essays by professional essayists. A snippet of a David Sedaris essay had me laughing out loud. So, if you have a college-bound child or grandchild, do both of you a favor and buy him or her this ebook. You’ll make the college application process bearable, and maybe even enjoyable. — Barbara DeMarco-Barrett, author of Pen on Fire: A Busy Woman’s Guide to Igniting the Writer Within (Harcourt, 2004; 8th printing). penonfire.com. Essay writing for college applications is dreaded by almost every high school student. But Janine’s Robinsons’ guide should be welcomed relief. Her book gives a quick 10 step approach that helps students find words to describe themselves, pick the story/anecdote that best shows and tells about them, and provides an outline for structuring the essay. I particularly like the “Quickie” summary at the beginning of each chapter. I encourage any parent with a high schooler working on college essays to get a copy- it will save you and your student time and heartache. The concept of writing the dreaded college essay is easily grasped in this well written down to earth guide. The ideas are straight forward and easily adaptable to various prompts that students might be asked to write to. I used another book last year with my son, and it made it seem so easy to him that he wrote a lovely narrative story, but he did not address the prompt in a straight forward manner. This book guides the writer through possible caveats making the process appear to be worth the work. Thank you Ms. Robinson! I can use this book with my students, although I wish I had it last year.